It is unlawful to hunt any wild animal except deer, coyote, waterfowl, or feral swine (wild boar) during the seven-day deer gun season, Nov. 27 – Dec. 3, 2017, between 30 minutes before sunrise to 30 minutes after sunset. However, you cannot hunt coyote or feral swine (wild boar) between 30 minutes after sunset and 30 minutes before sunrise during any of the deer gun and deer muzzleloader seasons. If hunted during the deer gun season, hours and legal hunting devices are the same as for deer gun season. Rifles and night vision scopes are legal for coyote hunting; however, rifles and night hunting between 30 minutes after sunset and 30 minutes before sunrise are prohibited during any deer gun and deer muzzleloader seasons. No restriction on hours. Closed only during the seven-day deer gun season, Nov. 27 – Dec. 3, 2017. Red, gray, fox, and black squirrels are legal game. Hours are 30 minutes before sunrise to sunset. Closed during the seven-day deer gun season, Nov. 27 – Dec. 3, 2017. Hours are sunrise to sunset in open counties. Hours are sunrise to sunset. Only male pheasants may be killed. Closed during the seven-day deer gun season, Nov. 27 – Dec. 3, 2017. 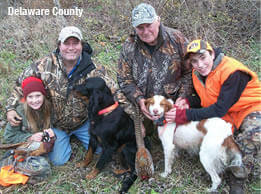 The ODNR Division of Wildlife will release pheasants for the youth small game weekends, Oct. 21 and Oct. 28. Additional releases will occur for Nov. 3, Nov. 10, and Nov. 23. The number of pheasants released will depend upon numbers available. Releases will take place at the Ringneck Ridge Wildlife Area (by permit only, find additional information at sanduskycountyparks.com), Charlemont Metro Park (Lorain County), and the following wildlife areas during pheasant hunting season: Berlin, Caesar Creek, Camp Belden, Darke, Delaware, Fallsville, Grand River, Highlandtown, Indian Creek, Killdeer Plains, Oxbow Lake, Pleasant Valley, Resthaven, Rush Run, Salt Fork, Spencer, Spring Valley, Tiffin River, Tri-Valley, West Branch, Wyandot, and Zepernick. No restrictions on hours except during the seven-day deer gun season, Nov. 27 – Dec. 3, 2017. These species may not be hunted between 30 minutes before sunrise to 30 minutes after sunset during the seven-day deer gun season. Hunters must purchase a hunting license and a fur taker permit to hunt these species. Hours are sunrise to sunset. Closed during the seven-day deer gun season, Nov. 27 – Dec. 3, 2017. Snowshoe hares are a protected species and not legal game. Hours are 30 minutes before sunrise to sunset. Closed during the seven-day deer gun season, Nov. 27 – Dec. 3, 2017. Feral swine are a non-native, invasive species. Feral swine are also known as wild boar, feral hogs, and feral pigs. Hunters are encouraged to report all sightings to the ODNR Division of Wildlife at 1-800-WILDLIFE (1-800-945-3543), or wildinfo@dnr.state.oh.us. You must possess a valid hunting license to hunt feral swine. If hunted during the deer gun season, hours and legal hunting devices are the same as for deer gun season. Rifles and night vision scopes are legal for feral swine hunting; however, rifles and night hunting between 30 minutes after sunset to 30 minutes before sunrise are prohibited during any deer gun and deer muzzleloader seasons. It is illegal to transport a trapped feral swine in Ohio. It is legal to live trap feral swine at any time, provided the feral swine are immediately euthanized at the trap location. It is illegal to use a foothold trap or snare for feral swine. Longbow or Bow: This includes compound bows and recurve bows. Shotgun: 10 gauge or smaller.